DFDS is the abbreviation of Det Forenede Dampskibs-Selskab A/S (literally “The United Shipping Company” because it is a merger of three shipping companies). It is a Danish shipping company which is the biggest in Northern Europe. Now that reminds me that Maersk (or A.P. Moller-Maersk Group), the biggest shipping company in the whole world is also Danish. It seems the Danish are low-key and not used to trumpeting their horns but they really know shipping. It also sets me thinking that the more heralded shipping Greeks might then just be overrated because of Onassis who was tops in self-promotion. DFDS is an old, highly regarded shipping line that was established in 1866 and that was exactly 150 years ago. The company is both into passenger and cargo shipping historically and now they even have subsidiaries. 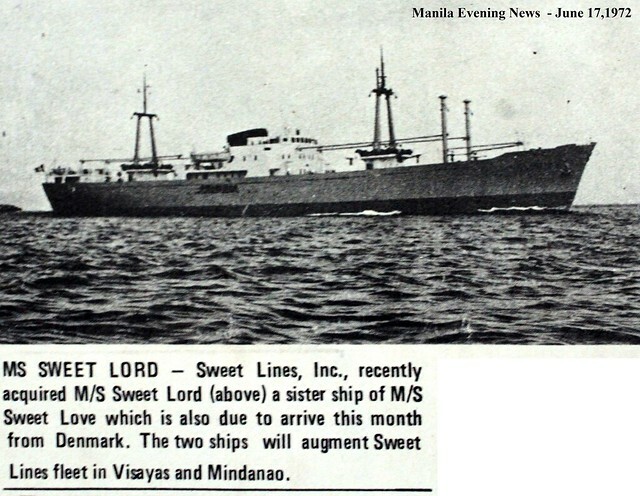 Sweet Lines Incorporated is a Philippine shipping company which started as the the Central Shipping Company in Bohol and they only changed name in 1961. Later, to handle their cargo/container shipping, Sweet Lines resurrected that company in 1981 while continuing to use the company Sweet Lines for passenger liner shipping. Sweet Lines actually started before World War II, was interrupted by the war like all other shipping companies then and they continued again after the war using mainly former “F” ships from the US Navy. 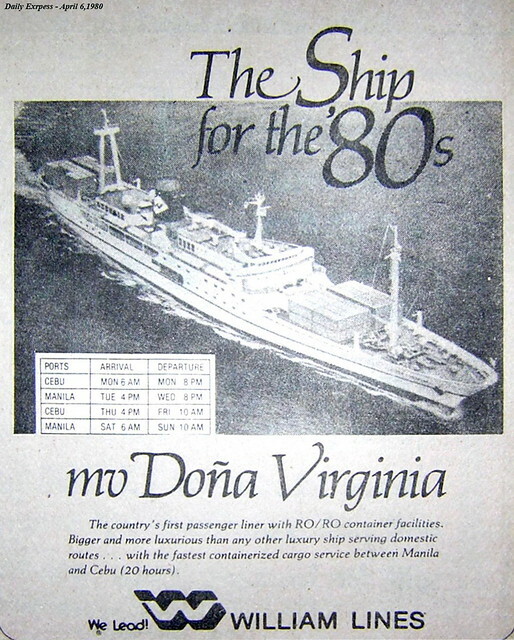 They were then just a regional shipping company but a dominant regional with routes linking Bohol, Siquijor, Cebu, Leyte and Northern Mindanao along with a few other ports of calls in other parts of Central Philippines. In 1965, the liner company General Shipping Company quit local shipping and then went into the overseas routes. They sold their local fleet along with its franchises and half of those ended up with Sweet Lines. That provided the opening for a dominant regional player to become a player in the national liner shipping scene. 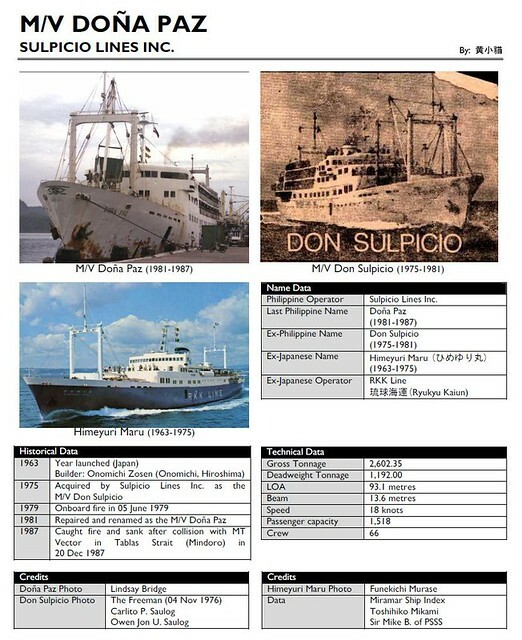 Except for one local-built luxury liner which became the Sweet Rose, all other ships conveyed from General Shipping were former “FS” ships which were the backbone of the Philippine inter-island shipping fleet after the war but which was already getting long in the teeth twenty years hence. In 1966, Sweet Lines bought the only liner of Royal Lines, the Princesa and renamed this to Sweet Peace. The next year, they bought the third Governor Wright from Southern Lines and renamed this into Sweet Sail. What is remarkable about these acquisitions is these two ships are better and faster than the former “FS” that was a war surplus of the USA. 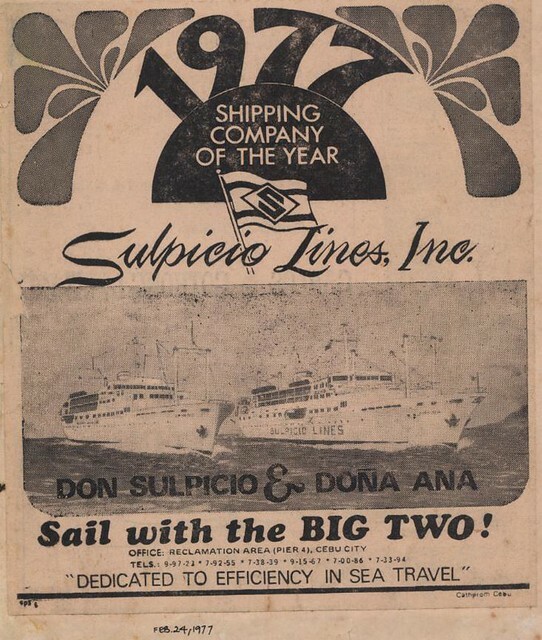 In 1967, Sweet Lines was sailing these two to Manila with the bigger Sweet Rose and the Sweet Ride, their only ex-”FS” ship in a liner route. What Sweet Lines did was they actually handed down to their regional routes their three other ex-”FS” ships from General Shipping Company thus bolstering their regional routes. These were the former General del Pilar, General Trias and General Lim. Since General Shipping always interchanged the names of their ships they then better be identified also with their IMO Numbers to avoid confusion. The three had the IDs IMO 6117992, IMO 6118023 and IMO 6117937 initially. In a change of IDs they were later the IMO 5127762, IMO 5127889 and IMO 5127736, respectively. Under Sweet Lines, the three became the first Sweet Trip, the first Sweet Ride and the first Sweet Hope, respectively. Where before, Sweet Lines only had former “F” ships for the regional battles, now they had also the bigger and better ex-”FS” ships. This early as a liner company, Sweet Lines’ template was beginning to show – they were not content to simply match the competitors’ fleet and here I am talking of quality and not of numbers. Up to 1967, the liner fleets of most of their competitors still consisted of former “FS” ships and some were lengthened former “F” ships. The next moves of Sweet Lines confirmed their model of building their fleet. Their next seven ship acquisitions from 1967 to 1973, for an average of a ship each year consisted of ships acquired from Europe. Five of these were from DFDS and among them was the great Sweet Faith. The two others were no less than the five. One was a brand-new liner built in West Germany, the Sweet Grace and the other was a luxury liner from Italy, the former Caralis, a luxury liner even in Italy which became the first Sweet Home and biggest liner of Sweet Lines until then and one of the few liners in the country then that was over 100 meters in length. Getting five passenger ships one after the other showed the DFDS connection of Sweet Lines. During this period the additional ship requirements of our liner fleets was being sourced from Europe as there were no more available war surplus ships from the USA and there was not yet a significant volume of surplus passenger ships from Japan. Among the local liner companies it was Go Thong & Co., Compania Maritima and William Lines along with the upstart Dacema Lines that were sourcing ships from Europe in significant number during this time. Of the five ships from DFDS, the most prominent of course and which became the flagship of Sweet Lines in the 1970’s was the Sweet Faith. This ship was a luxury liner even in Europe and was fast. She just sailed the premier Manila-Cebu route and that was paradigm-changing because she started the era of fast cruisers in the postwar years and by just sticking to one particular route without an intermediate port of call. She also launched what was called the “flagship wars” when William Lines decided to match her with the Cebu City. Sulpicio Lines later joined this war with their Don Sulpicio which was the later infamous Dona Paz. 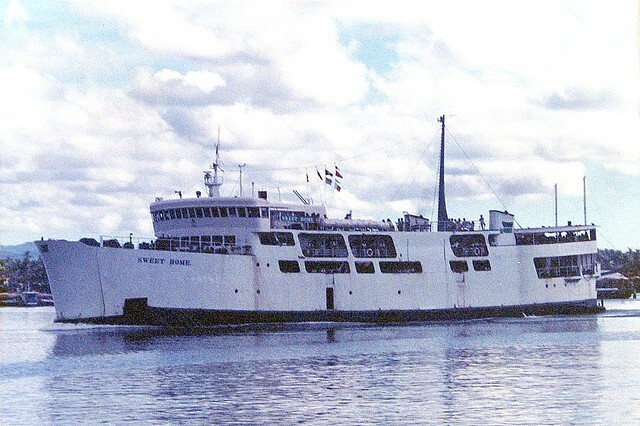 Sweet Home also joined this “flagship wars” in 1973 as pair to Sweet Faith doing only the Manila-Cebu route and she was also a fast cruiser aside from being a luxury liner. The other four ships from DFDS were passenger-cargo ships in Europe that has a small passenger capacity and which has a cargo boom bisecting the passenger accommodation below the bridge and the scantling at the stern. All four were built by Helsingor Vaerft in Elsinore, Denmark like the Sweet Faith. The four were actually a pair of sister ships. They were also by no means small. The first that came here were the sisters ships Elsinore, Denmark and Birkholm which arrived in 1967 and 1969, respectively. Here, the were renamed into the Sweet Bliss and the Sweet Life (this ship was later renamed into Sweet Dream). The Broager was actually the younger ship having been built in 1953 while the Birkholm was built in 1950. At 92 meters length, the two were already among the biggest liners in country then with a median speed but certainly a little faster than the war surplus types from the USA, the ex-”FS” ships, the ex-”Y” ships, the ex-”C1-M-AV1” ships and the Type N3 ships. The next batch that came were the Ficaria and the Primula and both came in 1972 and they were renamed into the Sweet Lord (later renamed into Sweet Land) and Sweet Love. The two were bigger than the Broager and Birkholm at 101 meters and they had a respectable speed of 14.5 knots when new. The Ficaria was built in 1951 while the Primula was built in 1952. Meanwhile, the Sweet Faith was built in 1950. So all these ships of Sweet Lines from DFDS were actually built in just one period. By 1974, Sweet Lines was no longer using ex-”FS” ships in the liner routes as they already passed on all this type to their regional routes and to their cargo shipping division. These five ships from DFDS became the backbone of their fleet and reinforced by the Sweet Home (the luxury liner ex-Caralis from Italy), the Sweet Grace (the brand-new liner built in West Germany in 1968) and by the local-built liner Sweet Rose acquired from General Shipping. This was the peak of the passenger fleet of Sweet Lines when even their respected rivals were still using a lot of war-surplus ships from the USA in their liner routes. At 84 meters the Sweet Rose was the smallest among the eight and that was remarkable. If the length of their liners are averaged Sweet Lines will beat all except the leading Compania Maritima and will about equal the relatively small liner fleet then of Negros Navigation. At this year Sweet Lines might have ranked 4th or 5th in fleet strength nationwide or even as high as 3rd if their regional and cargo shipping are considered. Compania Maritima was already weakening this time with a lot of sinking without new acquisitions, Go Thong & Co., had broken up in 1972 while Aboitiz Shipping Corporation and subsidiary Cebu-Bohol Ferry Company while numerous is simply loaded with old ex-”FS” ships. Actually the First Five or First Six in national shipping then were almost near equals, the first and only time I saw such near-parity. From such strength derived from an insistence on ship quality from the start as a national liner company and by ushering the era of fast cruisers in the postwar years and fighting well the “flagship wars,” I cannot, however. just sweep under the rug how Sweet Lines slipped from its exalted position. Imagine from being a newcomer in the national liner shipping scene in 1965 and reaching near-parity with the leading ones in just nine short years! Maybe such expansion hit Sweet Lines more than the others when the “floating rate” of the peso (an automatic currency devaluation mechanism) especially after the “Oil Shock” of 1973 when trade balance and foreign currency shortage happened with the fast rise of petroleum products. For five years from 1973 until 1978 they did not acquire any liner. And that is in the situation that their European-sourced liners are already getting old (well, the war-surplus ships from the USA are even older). While William Lines and Sulpicio Lines were quick to buy fast cruisers from Japan, a new ship source from the middle of the 1970’s, Sweet Lines got stuck up in those crisis years. A news item in the middle of that decade said that Sweet Lines will just concentrate on buying smaller ships and that turned out to be true because their next ship acquisitions turned out to be just in the 50-meter class which is marginal size for a liner. That size of ships they purchased in the late 1970’s were just the size of the ex-”FS” ships and with just the same speed, actually. If that was not regression, I don’t know what is. Well, that inaction also happened to Compania Maritima, Aboitiz Shipping Corp., Escano Lines, Carlos A. Gothong Lines Inc.+Lorenzo Shipping Corp. (the two had combined operations there before separating in a few years) and Madrigal Shipping and to all the minor liner shipping companies. The consistent move of William Lines and Sulpicio Lines determined their leading position later (is this what Ana Madrigal later said was “dirty”?). Meanwhile, the slide of the others can be traced to that. If the other shipping companies that did not make the bold move to fast cruisers thought the next decade will be better, then they probably got the shock of their lives when the economy got worse, much worse in the 1980’s. Financial and political crisis grew with the assassination of Ninoy Aquino and there was widespread discontent. The 1980’s turned into a “massacre decade” for our shipping when most of our liner companies, major and minor, did not survive that decade alive. Sweet Lines survived that decade alive but they were no longer first rank. Soon they will crash out too. But as they say, that is another story (and worth another article). Abangan!